CCB: What’s the appeal of working in TV? RR: I do not know. I don't watch myself on it. I just go to work like anyone else. Some days I cook, other days I report on my travels, and some days I write all day. I only think of TV when I turn it on to watch Larry David or CNN. Objectively, if you like to talk as much as you enjoy any thing else you do, TV is an option. Cooking on TV for myself is physically less grueling, for sure, than restaurant or market work. Plus, I get to story tell while I work. Fun. CCB: Do you have a typical day on the job? Is there a routine you follow? RR: Everyday is very different from the next. One day I am chatting up a celeb, the next I am teaching a crowd of kids, the next I am taping four shows a day, and some days I am just writing away on the laptop, finishing up another book. CCB: How did you figure out how things work on TV? Was this trial by fire? RR: Yup. I really sucked when I started. My movements were stiff. But, what has remained the same is my candor. I am honest and I tell it like it is. I am never afraid to really talk to an audience. CCB: What is your TV shooting schedule like? With four TV programs airing at the same time, are you constantly filming? Do you ever get any time off? RR: I take off two to three days a month each month. Then a couple of times a year I try and take a week or so vacation. Otherwise, I work 24/7. 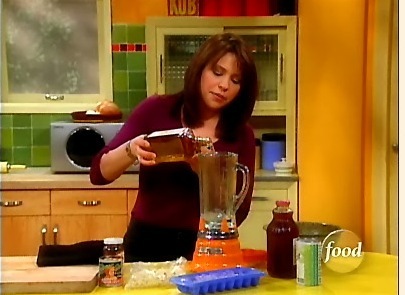 CCB: What does the Rachael Ray brand stand for? RR: Quality and value. I back very few things: a pot I designed on a napkin that I use every night and on my show, my knives -- hand forged and with a non-slip grip and an easy sharpening system, and EVOO -- my own import label of affordable olive oil. CCB: How do you stay organized with so many projects going on at the same time? RR: I am a complete mess! Basically, I have no assistant, yet. I write everything down in my little orange notebook with pens I steal from strangers. The notebook is held together with a rubber band. One other interesting tidbit. When asked about whether her Food Network shows would continue after she begins her talk show, Rachael said: "30 Minute Meals and Tasty Travels will both continue." So, I guess that means no more Inside Dish and no more $40 a day. I am not so sad about losing Inside Dish, but I loved $40 a day. Hopefully Tasty Travels will pick up the slack and include budget options in their picks. Please don't ask me how I find these things. I really have no idea. You totally should be her assistant, then you could go with her on the many Tasty Travels and eat for free. Also, no more $40 a Day? So not cool. Garrett - from your lips (or fingers?) to Rachael's ears. I will really miss $40 a day. I always rely on her picks when traveling somewhere so that I know I will at least have one good meal that is reasonably priced.